While digital marketing and evolving technologies seem to be taking over. Print marketing will continue to be an effective form of marketing for your business in 2018 and for years to come. Print marketing has many benefits over digital marketing. Such as tangibility, being seen as a more trustworthy source and its ability to stand out. 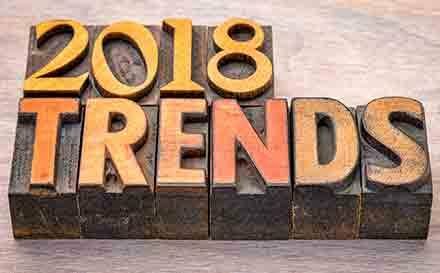 Each year we see new trends emerge, so what will big in the world of print marketing in 2018? In 2018 we will see print marketing return to simplistic designs. This means clear imagery that conveys the message negating the need for text-heavy explanations. The text should be kept short and to the point and white space will be maximised for a simple and clean design. Personalisation in print marketing will continue to remain a key factor in marketing campaigns. Using personalised materials help you to reach each of your customers on an individual level. Consider how you could use personalisation in your next campaign. Think beyond including customer names and focus on how you could use the data you have on your customers. So you can tailor offers or content using the information you have about their preferences and past purchases. Digital marketing is often seen as the enemy of print marketing, but this need not be the case and in fact, these two methods are the best of friends when combined. Your print and digital marketing efforts should complement each other, consider including social media icons or a QR code that links to your website on your printed materials to help your customers find you online. Combining the two methods can help you drive your social media following, grow your email database and drive sign ups to receive your brochures and other direct mail. Combining digital into your print marketing campaign also demonstrates you are a modern company with both an online and offline presence. The best print marketing campaigns usually have one thing in common, storytelling. Use your printed media as a platform to tell your story rather than just give your customers information. In 2018, storytelling will be a crucial aspect. Strong images will be used to convey the narrative of brands. Storytelling can be used in print marketing to tell your customers where you have come from, where you are heading, the history of your brand and your ethos. Everybody loves a good story and we can expect to see more storytelling in print marketing campaigns in 2018. We print all kinds of work, including stationery, leaflets, brochures, folders, and catalogues. Lemon Press work with many of the leading creative agencies and a variety of different businesses. We offer high-quality digital printing and lithographic printing from our Redditch premises.